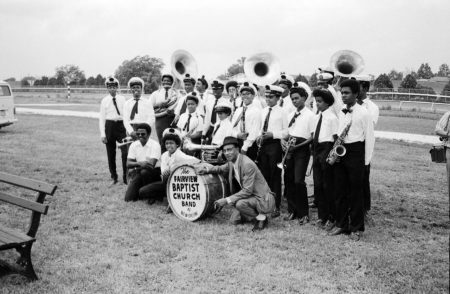 It is our good fortune that, in 1970, Reverend Andrew Darby and Danny Barker decided to form a brass band to help kids in their neighborhood stay out of trouble. Barker, a renowned jazz musician, lived around the corner from Darby’s Fairview Baptist Church. Brass band parades like the ones Barker grew up with in the 1910s and 20s were on the wane, and he saw an opportunity to seed a revival. Barker’s first recruit was Leroy Jones, a 12-year-old who lived in a house on this lot, shouting distance from the church on the corner of Buchanan Street. He was already practicing his trumpet for four or five hours every day after school in his family’s garage. Barker recognized his drive and appointed him leader of the Fairview Baptist Church Christian Marching Band (Barker and Charles Barbarin, Sr. would chaperone). 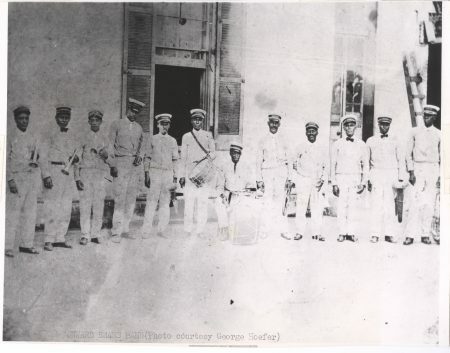 Barker arranged for the band to learn the way he had: on the job. 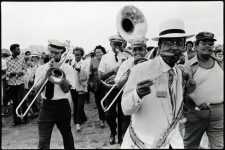 Their first paying gig was at the 1971 Jazz and Heritage Festival. Social aid and pleasure clubs started hiring the Fairview band for their parades. Before long, Jones’ garage was brimming with young people from across the city. 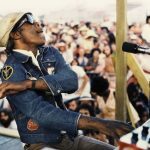 By 1973, with a pool of nearly 30 young musicians, Barker and Barbarin booked jobs for up to three different groups at once. Fairview band members learned a traditional brass band repertoire, and professional protocol like what to wear and how to behave on a gig. 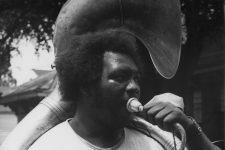 Barker, a jazz historian as well as a musician, instilled a sense of pride in his charges: they were stewards of a venerable tradition. In 1974, some members of the local musicians’ union objected to Barker steering so many gigs to the youngsters. He stepped back, and a remarkable number of his students prospered as professionals. 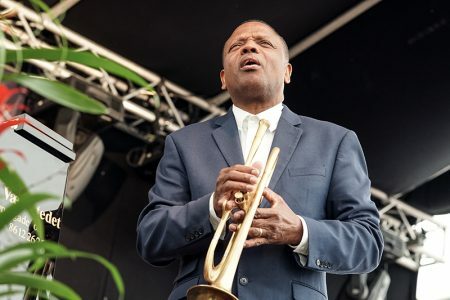 Leroy Jones formed the Hurricane Brass Band with Fairview alumni, alto saxophonist Darryl Adams spun off the Tornado Brass Band the next year, and Anthony “Tuba Fats” Lacen led his own group, the Chosen Few Brass Band. Clarinetist Michael White (now Dr. Michael White) and trumpeter Gregg Stafford each led more traditional groups, the Original Liberty Jazz Band and the Young Tuxedo Brass Band. 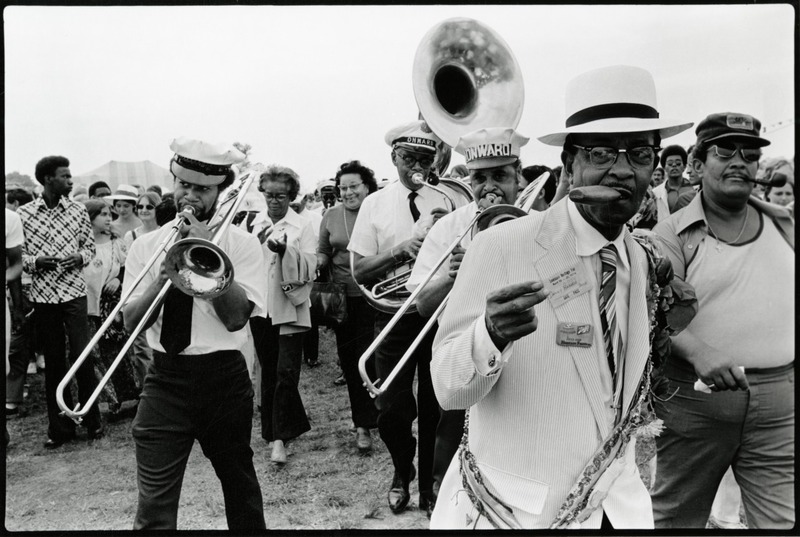 Herlin Riley and Shannon Powell became two of New Orleans’ finest drummers. 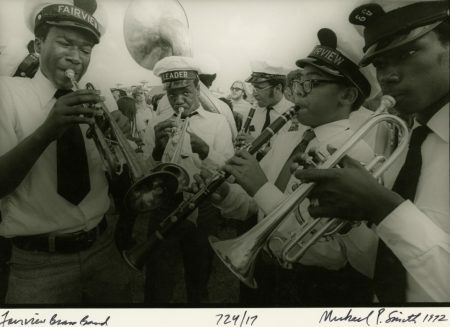 Though they weren’t part of the core group, Branford and Wynton Marsalis carried their experience playing with the Fairview band with them on their way to national stardom. Fairview alumni also followed Barker’s example as an educator and documentarian. 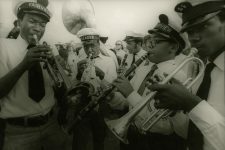 Clarinetist Joe Torregano, Stafford, and White taught in classrooms; Tuba Fats apprenticed young musicians in Jackson Square, where they played for tips. White published scholarly writing on jazz history and Riley co-authored a book about second line drumming. 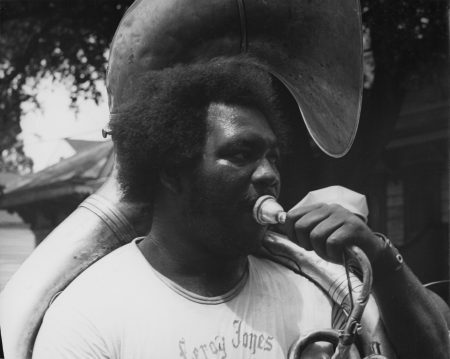 Torregano told author Mick Burns that the Fairview band “saved jazz for a generation in New Orleans.” That might be underselling it. Fairview alumni have now been standard bearers for traditional jazz for over forty years, mentoring countless younger musicians. 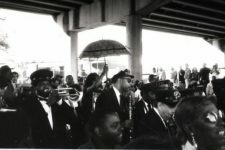 At the same time, some of their brass bands pointed toward a modern style—dressing casually, adapting R&B songs, playing heavy, danceable tuba riffs—that inspired a second line renaissance in the 1980s and 90s. Today the city is full of kids who follow parades nearly every Sunday like Barker did, and need no intervention to form bands of their own. 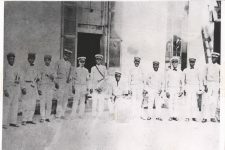 The Onward Brass Band included some of the brightest names in early jazz, including Manuel Perez (at far left) and King Oliver. 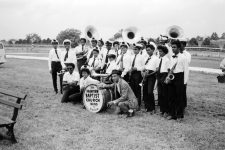 Danny Barker followed the band when his grandfather, Isidore Barbarin, was a member, and shared this legacy with young musicians in the Fairview Baptist Church band. 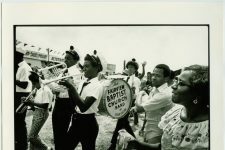 The Fairview Baptist Church band including Leroy Jones on trumpet, Gregg Stafford on trumpet, and Michael White on clarinet, 1972. 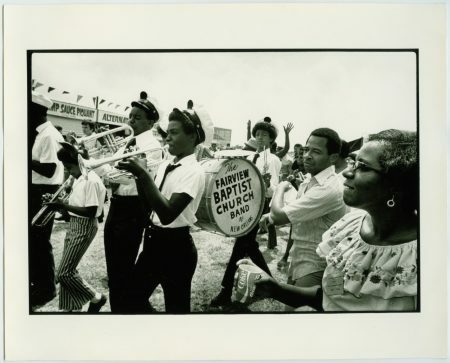 The Fairview Baptist Church Band with Wynton Marsalis at the New Orleans Jazz & Heritage Festival. 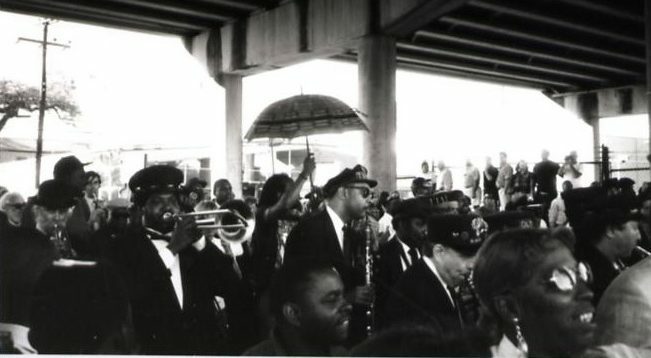 Fairview Baptist Church band alumnus Dr. Michael White plays the clarinet at Danny Barker’s funeral on Claiborne Avenue in 1994. The event inspired the creation of the Black Men of Labor Social Aid and Pleasure Club. 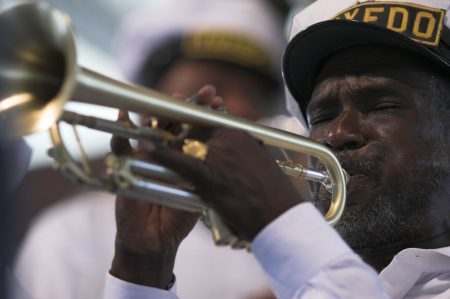 Gregg Stafford, seen here in 2007, took leadership of the Young Tuxedo Brass Band in 1984. 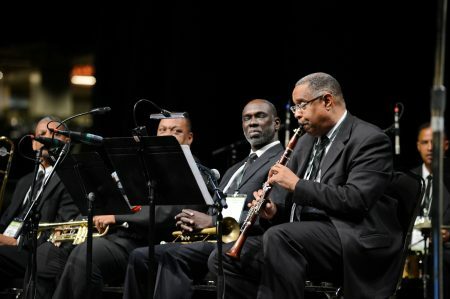 Several Fairview Baptist Church band alumni have played in the group, including Dr. Michael White, Joe Torregano, and Charles Barbarin, Jr.
From 2013, Dr. Michael White (clarinet) leads his Original Liberty Jazz Band. To his left, with a trumpet, is fellow Fairview Baptist Church band alumnus Gregg Stafford. Leroy Jones leading his traditional jazz band in Denmark in 2017. Wikimedia Commons. Photo by Hreinn Gudlaugsson.